Hey there! Happy Cinco De Mayo! As promised, I’m back today with a full set of detailed furniture plans for DIYing the homemade end tables that you saw last week on the blog. But guess what? I have a very special guest to introduce to you today. 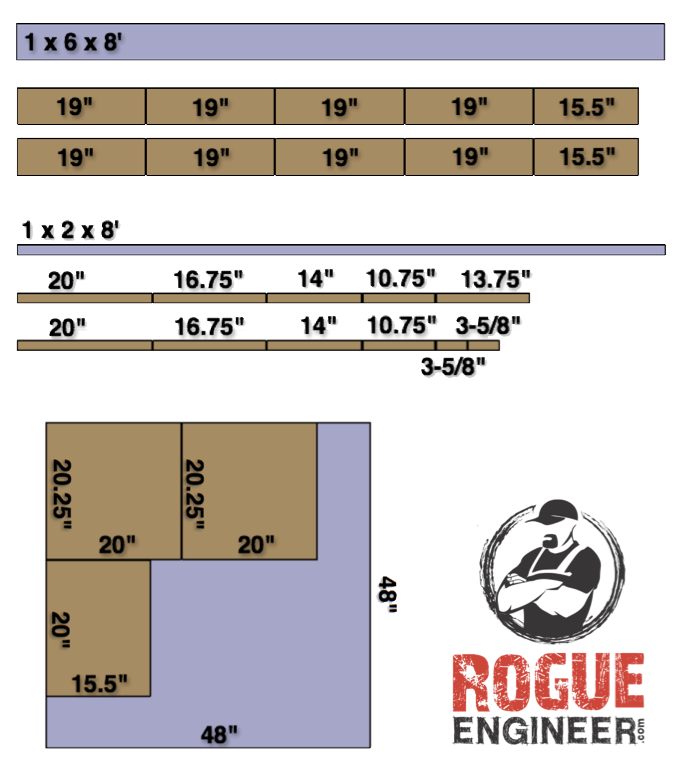 Jamison over at the Rogue Engineer is here to show you guys how to build these end tables using his amazing CAD skills! I am SO honored and excited to be showcasing his talent here on my blog for the first time today, and hopefully you guys will see more from Jamison here in the future as an Unskinny Boppy collaborator! I am going to be introducing a few more fun collaboration projects in the near future with lots of great DIY projects from some really talented folks, so stay tuned for more! But today, I’m SUPER excited to let Jamison walk you through the step-by-step on how to build a pair of night stands (or end tables) from scratch. Ok, without further ado… take it away, Jamison! Hey everyone, I’m Jamison, creator and author of RogueEngineer.com. 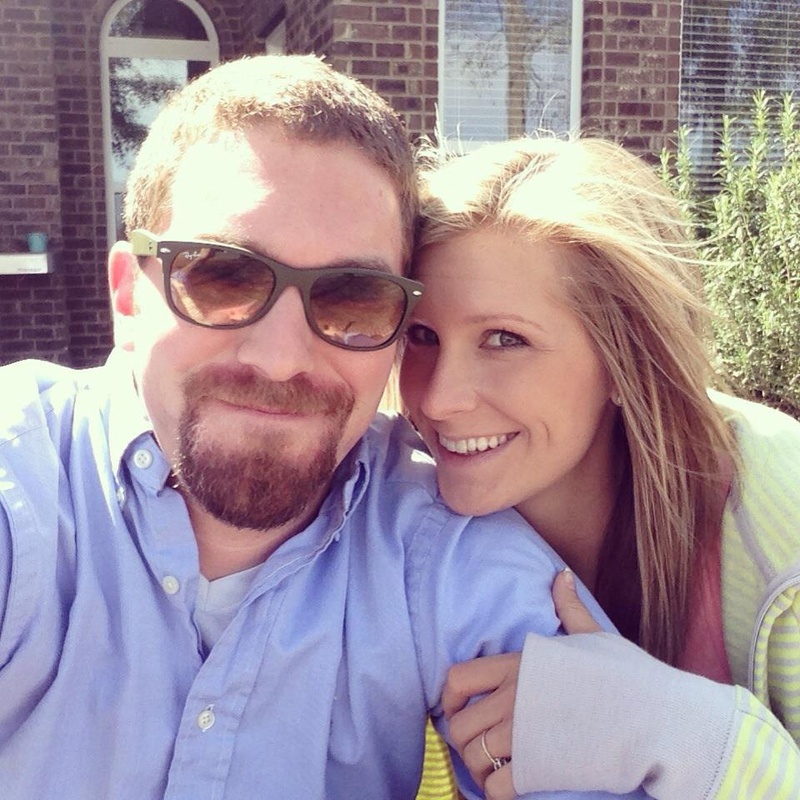 First and foremost, I’m a Christian, a father of two awesome kids, and a husband to my beautiful, supportive wife, Jamie. (Aww.. Jamison and Jamie… That’s so cute!… Yeah, Yeah. I know. Let’s move on.) I’m also an aerospace engineer by day and crazy DIY furniture ninja by night (our at least that’s how I envision it). My engineering expertise lies in mechanical design so this makes it easy for me to model up cool furniture in 3D. I’ll go ahead and admit that I’m no expert woodworker, by any stretch of the imagination. So I use my mechanical design skills to recreate popular furniture using common supplies found at most DIY box stores and in such a way that anyone can build it (including me). Learn more about me here. So, I got introduced to Beth a few weeks ago though my sister-in-law, and let me tell you something, she has been awesome! Being the new kid on the DIY blogging scene, and one of very few guys, I initially felt a little on my own. Getting to know Beth has been great and she has been a HUGE help to me and my site. So when she told me about these sweet end tables her and her husband had just built using old windows, I thought it would be the perfect opportunity to give back to Beth and her community. And so, the Unskinny Boppy Knock-Off End Table was born. 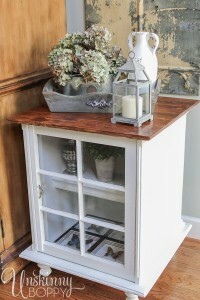 Since Beth made out like a bandit with those awesome windows she used for doors, and well, most of us won’t be able to replicate that, I thought it would be a good idea to create a similar, easy-to-build, end table made using stock wood found at either Big Blue or Big Orange. Note: Blue colored boards signify stock size and the brown boards following signify how to cut those stock boards. Cut List – Print This! Assemble the top and bottom using eight 1x6x19″ boards; four each. Drill pocket holes, as shown, in three of the four boards for top and bottom. Align the boards, check for square, clamp and screw together using 1-1/4″ pocket hole screws. Assemble the face of the end table by first drilling pocket holes, as shown, in each end of the two 1x2x14″ boards. 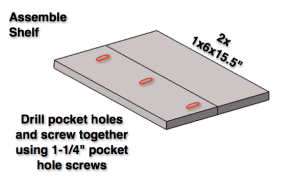 Align the boards as shown, check for square, clamp and screw together usingÊ1-1/4″ pocket hole screws. 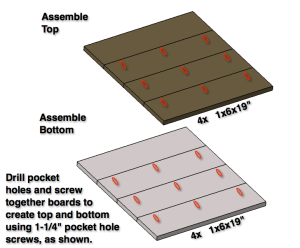 Assemble the shelf using two 1x6x15.5″ boards. Drill pocket holes, as shown, in one of the boards. Align the boards, check for square, clamp and screw together using 1-1/4″ pocket hole screws. 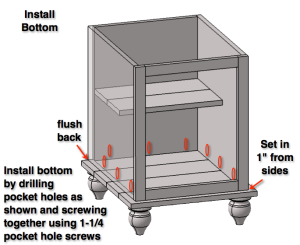 Install the shelf by first drilling pocket holes, as shown. Align the shelf 10″ from the bottom of the box. 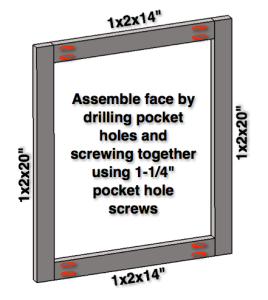 Check for square and level then screw in place using 1-1/4″ pocket hole screws. Locate each foot 2″ away from closest sides. 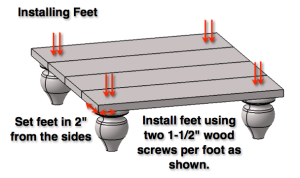 ÊInstall feet using two 1-1/2″ wood screws per foot. (This prevents feet from spinning) Note: Depending on which feet you purchased you may have a screw built into the foot in which case you cane screw it in place or remove and follow the steps above. 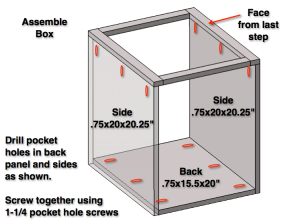 Install the bottom by first drilling pocket holes in the box, as shown. Align the bottom so that the back is flush with the back of the box and the sides and front are set in 1″. Then screw in place using 1-1/4″ pocket hole screws. 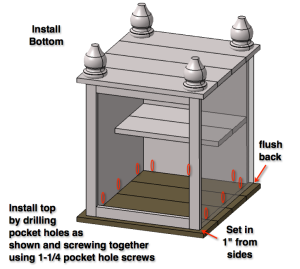 Install the top by first drilling pocket holes in the box, as shown. Align the top so that the back is flush with the back of the box and the sides and front are set in 1″. Then screw in place using 1-1/4″ pocket hole screws. Check to make sure your opening is 14×17″. 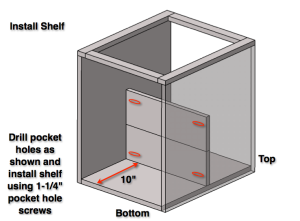 If smaller or larger adjust the door dimensions to assure 1/8″ spacing around door. 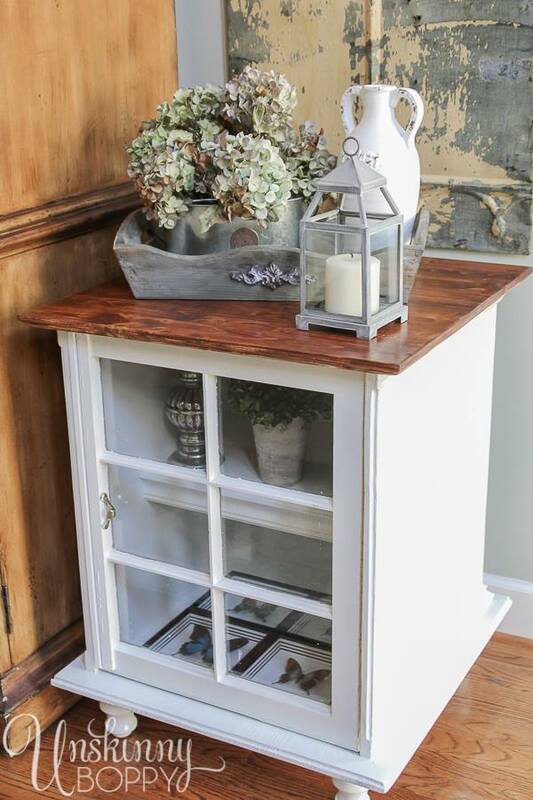 Assemble the door of the end table by first drilling pocket holes, as shown, in each end of the two 1x2x10-3/4″boards, the two 1x2x3-5/8″ÊÊboards and the 1x2x13-3/4″ board. 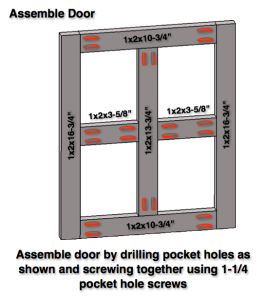 Align the boards as shown, check for center and square then clamp and screw together usingÊ1-1/4″ pocket hole screws. Cut the base cap moulding to size for top and bottom. Make sure to cut the moulding flush with the back of the table and miter the front corners at 45 degrees. Nail in place using a finishing nailer with 1-1/4″ brad nails. 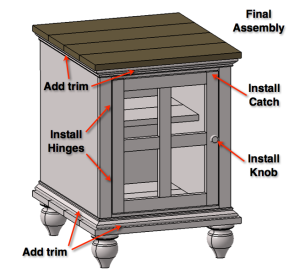 Install inset hinges by evenly spacing and screwing to end table using included mounting screws. Next install door to hinges, making sure to leave even spacing all the way around. Install knob and catch using included mounting hardware and your done. I know this is a ton of detailed information but I do this so that more people who may not have had the confidence to try something like this in the past will give it a try. Have fun with this project and if its your first furniture build then make sure you take your time. Be creative. These plans are here for your enjoyment so, by all means, if there’s something you want to change, go for it! Don’t forget to post your finished product on the brag page! ENJOY! LOVE all the detailed instructions – I am a visual learner! And it’s pretty awesome that I could have an Unskinny Boppy knock off table now, too!! Okay… I’m loving this! Unskinny Boppy’s design sense & Jamison’s instructions for those of us who don’t have Beth’s husband Jeremy at home. Win-win! Next project… come do my mudroom! Or deck. Whattaya think? Hello…? Seriously, this is fantastic! Jamison did a fantastic job explaining everything – MUCH better than, say, IKEA! <— Boo! Now if only I can clone him and have him come and do all of the DIY stuff around my house that my husband always puts off. I'm bookmarking his blog and am looking forward to future projects that I can do! I love when worlds collide and create this sort of brilliance! You had me at cut list! Awesome project. What a beautiful side table, and great tutorial!! Thanks Keri! I’m a visual learner as well and tend to only look at the pictures so I always take that into consideration for others when write plans. Thanks Marcia! Ill being redoing my mudroom/garage entry area sometime in the future… be on the lookout for that one! Thanks Natalie! The way I look at IKEA stuff is if your gonna build it anyway.. take a little extra time and build it right. Most of the projects I post are super easy and very rewarding! Thanks Allison! Glad you enjoyed! Haha thanks Jacque! How can you lose with a cut list like that! Thanks Karah! There’s more where that came from! I love this! Such a great side table!!! I love the window look… so pretty! Thanks Rachel! Its easy for me since I just copy someone who already knows what they are doing. Oh so cool! Love the easy instructions for this. Can’t wait to try it!! I’m Just Curious, You Don’t Really Say How To Install Glass In The Door. Assuming, Like You Said That You Can’t Score Old Windows And Have To Build Your Own. I see where they have measurement 20.5′ and 15.5′ and .75. Does that mean 20 and 1/2 and 15 and 1/2 and .75 means 3/4″ ? This is AWESOME! Great job on all the detailed instructions!! Wish I had even ONE Engineer brain cells!!! Step 4….should it be 1x2x15.5 instead of 1x6x15.5? à¸žà¸¹à¸”à¸§à¹ˆà¸²:The structure for your site is a bit off in Epiphany. Even So I like your web site. I may need to use a normal browser just to enjoy it.